Alaska is a great land and oftentimes called as the “last frontier” because of its vast natural resources like the forest, minerals, oils and marines. The capital city is Juneau but the largest and most populated city is Anchorage. Aside from its magnificent and moving glaciers, Alaska is also a land with hot springs and ice covered streams. The climate varies from extraordinary snowfalls to extreme sun’s heat. If you plan to visit Western Alaska, expect a climate which is colder with less precipitation, heavy winds and snow. On the other hand, Central Alaska offers a more continental climate with its higher temperature. Summer and autumn are the best months to travel in Alaska. Experience the exciting activities as they celebrate Sitka’s Alaska Day which is the commemoration of the day when it became part of the America. Included in this celebration are fireworks display, ice carving competitions, sled dog races and other outdoor games. While in Alaska you can avail of package tours with outdoor adventures such as the helicopter glacier tours, glacier landing and even a dog sled ride. You can also join a rail tour that will take you to the coastline and interior of Alaska. If you love the waters, you can book an ocean cruise or a fishing charter. 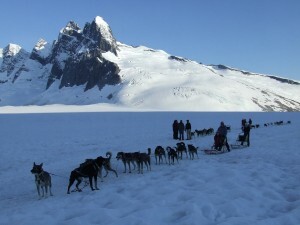 Never leave the place without experiencing the Alaska dog mushing on the glacier. Your Alaskan vacation becomes more unforgettable with the zipline tours, glacier hikes, kayak tour and sports fishing. Wildlife viewing is also a popular activity for those who enjoy wilderness which is the home to moose, bears and eagles. In Alaska, the accommodations are within budget. There are affordable hotels, hostels and motels for tourists and travellers which offer excellent services and allow you to get to know more the friendly and charming people in the country. Start now and plan your dream holidays to the authentic Alaska.